Kuroi laid in the Pokemon Center resting area with Ace lying next to him. As he laid there he got the feeling that something was wrong. The longer he laid there he felt the feeling grow inside of him. He got up carrying Ace in his arms letting him sleep. As he arrived outside he heard people talking about a trapped pokemon. This bothered Kuroi because of his strong love for pokemon. Kuroi approached the people trying to figure out what was wrong. "Would you all mind telling me what is going on?" "There is a Snorlax blocking a cave entrance with a pokemon behind it trying to get out." Kuroi just shook his head because he had to do something about it. "Can you tell me where I can find this Snorlax and remove him. Please tell me I do not care about this risks I just want to save the pokemon that is trapped." Kuroi was surprised none of the people said anything except all pointed in one direction. Kuroi nodded and began walking in that direction they pointed. Re: Slumbering Pokemon Event Thread. Kuroi walked there with a sense of urgency. He made sure he had all of his pokemon with him. As he walked he felt Ace shift in his arms still sleep. Kuroi would let him sleep until he got to his destination. The longer he walked the more louder he could here a muffled cry in the distance. Hearing that cry caused Kuroi to move a little faster than before. After walking for several more minutes he heard loud snoring from in the distance. "What the..?" As Kuroi walked up the hill he saw a Snorlax blocking the entrance from the cave. That was not the only thing that caught his attention but the crying that was coming from behind it. "This is going to be hard." He needed a way to move the Snorlax and get the pokemon out. Kuroi stood there for a second stunned by the Snorlax appearance. It seemed almost impossible to move him but he would have to try. Kuroi put Ace onto his head as he drew two pokeballs out of his pocket. He threw Kon's out in front of him thinking maybe Kon could awaken him and make him move. "Hey Snorlax wake up!" Kuroi yelled at the Snorlax to no avail. Kon looked up at him waiting on his orders. Kuroi looked down on him knowing what the risks would be if they fought this pokemon, but he had to save that pokemon behind Snorlax. "Use Double Kick!" Kon charged at Snorlax then jumped in the air sending both feet at Snorlax's stomach. Snorlax just stopped snoring for a second then started snoring again. Kuroi shook his head in disappointment, he was not disappointed in Kon's attack but Snorlax's reaction. He was going to risk Kon trying this again. "Kon use Double Kick again!" Kon charged at Snorlax again before jumping in the air firing both feet at Snorlax's stomach. Something different happened this time. Snorlax opened his eyes and stood to his feet letting out a large roar. Snorlax sat down in front of the cave looking down on Kon. Kuroi had awoken Snorlax but now he needed to move it from in front of the cave. Snorlax began charging an orange beam in his mouth then fired it at Kon. "Dodge then use Double Kick again!" Kon moved to the right narrowly dodging the Hyper Beam. Kon charged at Snorlax before sending both feet to his stomach. Snorlax let out a small yelp then smacked Kon away. Kuroi looked over in Kon's direction who struggled to his feet before falling to the ground. He turned his attention back to the Snorlax. "Move out of the way!!" Kuroi yelled out at the Snorlax. He just watched as Snorlax shook his head. Kuroi took out two pokeballs one for Kon and the other for Sona. Sona jumped out of the pokeball ready for a battle. Kuroi smilied at the will of his pokemon. "Sona use Swift!" She charged at Snorlax before jumping in the air and sending a flurry of stars at Snorlax. Snorlax just brought his massive hands up to his face to block the stars. He rubbed his eyes before locking them on Sona again. He opened his mouth and began charging another Hyper Beam. Kuroi knew that if he hit dead on this could be bad. He thought of a plan while Sona waited on his command. "Sona dodge then use Double Hit!" Snorlax released the Hyper Beam as Kuroi was yelling. Lucky him Sona managed to hear him and rolled out of the way as some of it hit her tail causing her to let out a small yelp. She got to her feet then lunged toward Snorlax as her tail grew purple and smacked him with it twice knocking him sideways onto his side. Kuroi was pushing the limits but he was going to be aggressive. Kuroi watched as Snorlax let out a deep roar before standing to his feet. Sona raced back to Kuroi climbing on his head. He watched as Snorlax took one step before falling flat on his face falling back asleep again. Once Snorlax fell forward the cave entrance was open. From the distance Kuroi could see a dark figure coming from out of the mouth of the cave. Kuroi runs up to see that the pokemon is an Omanyte. The pokemon stares at him strangely. Kuroi takes out a pokeball and the Omanyte's eyes concentrate on it trying to figure out what Kuroi is going to do. "See I love water pokemon and I was wondering if you want to join my team?" 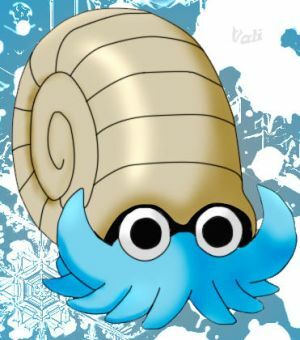 The Omanyte stared at him blankly. Kuroi took the pokeball and placed it on Omanyte head as the red beam took him in. Kuroi waited as the pokeball went back and forth. Finally the pokeball settled; he reached down and picked it up letting out his new pokemon. Kuroi examined the Omanyte trying to think of a nickname for it. "Do you like Titan?" Omanyte nodded before resting on Kuroi's leg. He put Titan in his pokeball and headed back to Fauna City to get some sleep. He was extra happy because he managed to save another water pokemon.